Fig. 1. 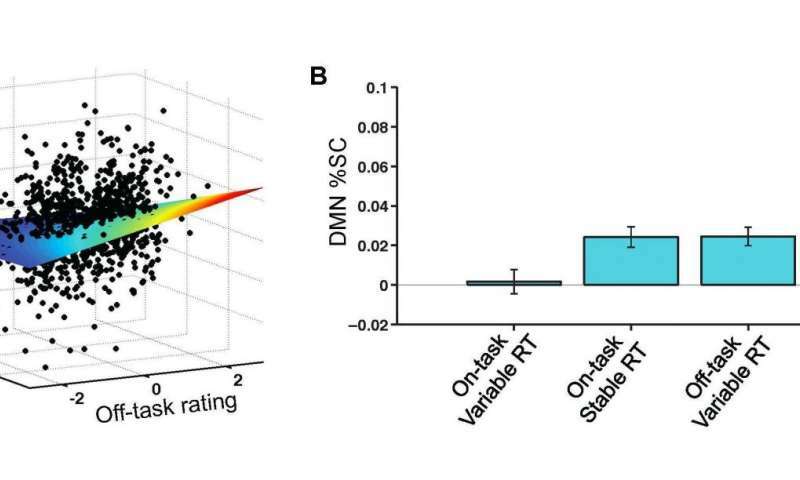 DMN activity correlates positively with self-reported off-task attention and negatively with behavioral variability. (A) The DMN mask used for extracting mean activity, including cortical and cerebellar regions. (B) Within-subject Fisher-transformed Pearson correlations between prerating DMN %SC and off-task rating across 36 trial-blocks within each subject. (C) Within-subject Fisher-transformed Pearson correlations between prerating DMN %SC and prerating RT variance across 36 trial blocks within each subject. In B and C, shaded dark gray denotes SEM, shaded light gray denotes SD, dark line denotes mean across subjects, and dotted line demarcates zero value. *P < 0.05, two-tailed Wilcoxon signed rank test. DMN, default mode network; RT, reaction time; SC, signal change. Kucyi A, Esterman M, Riley CS, Valera EM (2016) Spontaneous default network activity reflects behavioral variability independent of mind-wandering. Proc Natl Acad Sci USA 113(48):13899–13904. (Medical Xpress)—With thousands of basic and clinical neuroscience studies carried out over the past 15 years, the Default Mode Network (DMN) – a network of highly co-correlated interacting regions whose activity is very active during wakeful rest and distinct from that of other neural networks – is one of the most highly-investigated networks of the brain. Nevertheless, identifying the DMN's central role has remained elusive due to contradictory results: The dilemma is that while mind-wandering diverts attention from one's sensory environment and thereby creates unstable (i.e., variable) task performance, the DMN has been found to be active during what appear to be incompatible states. On the one hand, the DMN is active during intense mind-wandering (thinking about oneself or others, and recalling the past or planning the future), and on the other hand, the DMN is active during stable, rather than variable, behavior. Recently, however, scientists at Massachusetts General Hospital and Harvard Medical School as well as Boston University have demonstrated for the first time how these two explanations of DMN activity are more compatible than they might have seemed. In so doing – and while acknowledging that DMN fluctuations may reflect a higher-level function related to both stable behavior and mind-wandering (a potential example being memory reconsolodiation) – the researchers conclude that their findings call for a need to reinterpret the significance of DMN activity fluctuations in daily life as well as DMN disruption in disease. Dr. Aaron Kucyi, now at Stanford University, discussed the paper that he, Prof. Eve M. Valera and their colleagues published in Proceedings of the National Academy of Sciences. He notes that two aspects of their study – showing that DMN activity increases with stable, rather than variable, behavior, independent from increases with mind-wandering, and testing the hypothesis that single measures of attentional states (based either on self-report or behavior) are alone insufficient to account for DMN activity fluctuations presented the researchers with the same challenge: the fact that previous studies – theirs and others' – showed seemingly contradictory results. In some of those studies, Kucyi explains, people were instructed to perform tasks in which, every second or so, they had to respond quickly and consistently to changing images. Sometimes they perform more consistently and make fewer errors – often called being in the zone – and other times they are out of the zone, showing variable performance and making more errors. Also, he adds, in some studies people were asked from time to time whether they consciously thought that they were closely paying attention to the images in front of them or whether they thought their mind was wandering. "Together," Kucyi tells Medical Xpress, "the studies showed three highly consistent results: mind-wandering occurs during inconsistent, out of the zone behavior; mind-wandering occurs during increased Default Mode Network activity; and consistent, in the zone behavior also occurs during increased DMN activity. We were therefore confused about how increased DMN activity could occur with both mind-wandering and with being behaviorally in the zone, even though mind-wandering tends to occur during out of the zone-like behavior." The problem turned out to be that previous brain imaging research studied either only mind-wandering (based on self-reports of when people thought they drifted off) or only behavior (based on fluctuations of reaction time). Fig. 2. 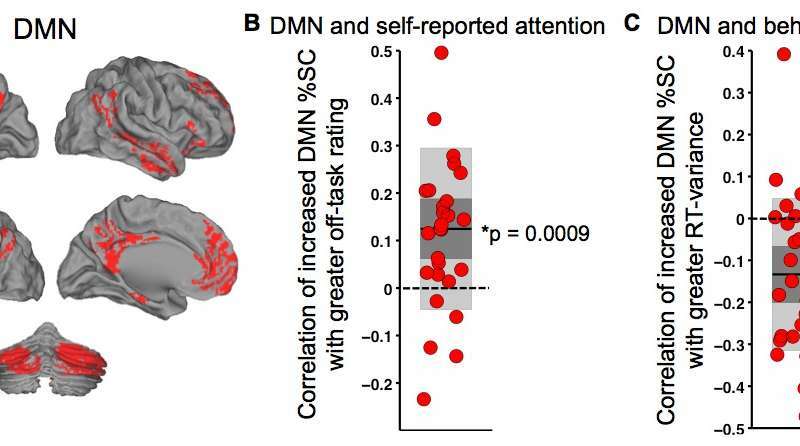 Self-reported attention and RT variability additively account for DMN activity. (A) 3D plot showing all trial blocks in all subjects with values for off-task rating (x1; within-subject normalized off-task rating), RT variance (x2), and DMN %SC (y). Color is proportional to mesh surface height, with red areas highest (high DMN activity) and blue areas lowest (low DMN activity). (B) Bar plots showing mean DMN %SC in trial blocks with four combinations of on-/off-task attention and high and low RT variance, with on/off (low/high) categories defined based on median split of all trial blocks of all subjects for within-subject normalized off-task ratings and RT variance. 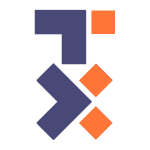 DMN, default mode network; RT, reaction time; SC, signal change. Kucyi A, Esterman M, Riley CS, Valera EM (2016) Spontaneous default network activity reflects behavioral variability independent of mind-wandering. Proc Natl Acad Sci USA 113(48):13899–13904. "We had to develop a new way to study and analyze how DMN activity relates simultaneously to both mind-wandering and behavioral states. Doing so would let us determine whether the changes in DMN activity associated with behavior are independent from or are related to the changes associated with mind-wandering. " The scientists developed two innovative approaches that allowed them to address these challenges. "We developed a cognitive task for people to perform during fMRI that allowed us to sensitively capture both when their behavior fluctuated and when they were spontaneously mind-wandering, which can be studied in the fMRI setting using thought probes where people are intermittently asked to report whether they were just thinking of the task that they are doing, of something in their sensory surroundings, or of something completely unrelated – for example, their dinner plans. My co-author Michael Esterman had previously developed a Gradual Continuous Performance Task, or gradCPT, which requires that people sustain their attention successfully for long periods. In that task, people view gradually changing images and have to press a button each time they see a new image showing a scene of a city, but they have to withhold their response whenever they see a rarely appearing image of a mountain." Over time, Kucyi points out, the speed at which people respond fluctuates considerably and somewhat spontaneously between states of being consistent and inconsistent. In the new study, however, the gradCPT was performed in combination with thought probes – that is, subjects are unexpectedly asked to relay what they were just thinking about – which captured both behavioral fluctuations and instances when people felt that they had drifted off and mind-wandered. "We also developed a way to analyze data that allowed us to determine whether the changes in DMN activity associated with behavior are independent from or are related to the changes associated with mind-wandering. In brief, the approach involved testing a statistical model which simultaneously took into account three things that fluctuated considerably over time within our volunteer subjects: DMN activity, self-reports of levels of mind-wandering, and levels of behavioral consistency." The paper reported a number of interesting results, one being the implications of reinterpreting the significance of DMN activity fluctuations in daily life and in DMN disruption due to disease. "Mind-wandering is a huge part of our daily life," Kucyi points out, "accounting for 30-50% of our experience when awake." A currently predominant idea in neuroscience is that DMN activity fluctuates to high levels when people are disengaged with the external world and are instead focused on their inner thoughts. "Our study confirms that DMN activity is higher when people are mind-wandering, but our findings add a layer of complexity to that story: Yes, DMN activity increases with more intense mind-wandering, but DMN activity also increases with more consistent behavior that is completely unrelated to conscious mind-wandering. Therefore, if we could measure someone's DMN activity level at any given moment in their daily life, we could not conclude based on a high level of DMN activity that he/she is currently mind-wandering." Fig. 3. 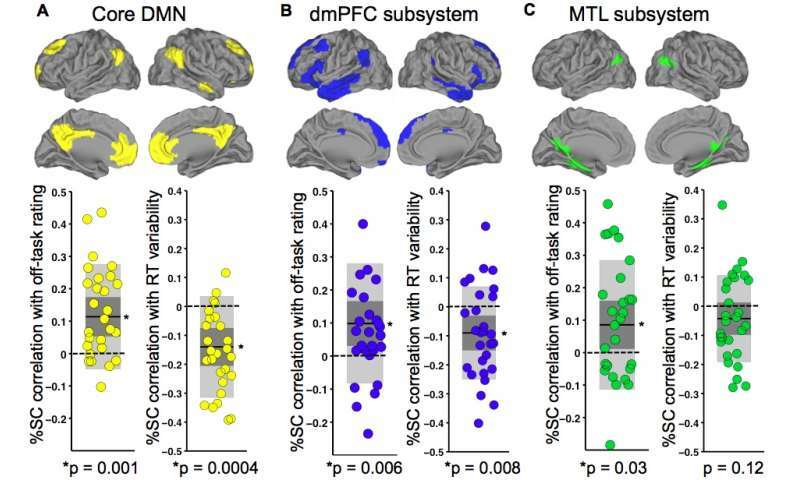 Subsystems of the DMN are associated with self-reported attention and RT variance. For each subsystem, we show within-subject Fisher-transformed Pearson correlations of prerating %SC with off-task rating (Left) and RT variance (Right) across 36 trial blocks within each subject. (A) The core DMN regions (yellow). (B) The dmPFC subsystem regions (blue). (C) The MTL subsystem regions (green). In all plots, shaded dark gray denotes SEM, shaded light gray denotes SD, dark line denotes mean across subjects, and dotted line demarcates zero value. *P < 0.05, two-tailed Wilcoxon signed rank test. DMN, default mode network; dmPFC, dorsomedial prefrontal cortex; MTL, medial temporal lobe; RT, reaction time; SC, signal change. Kucyi A, Esterman M, Riley CS, Valera EM (2016) Spontaneous default network activity reflects behavioral variability independent of mind-wandering. Proc Natl Acad Sci USA 113(48):13899–13904. To the second point, Kucyi notes that DMN activity is disrupted in a very wide range of psychiatric and neurological disorders – for example, attention-deficit/hyperactivity disorder, depression, Parkinson's disease, epilepsy, and chronic pain – but that it is unclear how these disorders may change DMN activity or how DMN activity may predispose people to developing disease. "Sometimes a failure to shut down the DMN is interpreted as a lack of control over mind-wandering. However, our study suggests that the story is not so simple. An overactive DMN does not necessarily mean increased mind-wandering and could instead be indicative of a more fundamental dysregulation of brain activity with a range of possible consequences." The paper also stated that further work is needed to uncover the behavioral relevance of dynamic communication within the DMN and with other networks. "In our study we analyzed the overall level of activity in the DMN, but we could also measure communication between regions of the DMN and other systems that work together as networks," Kucyi explains. "Thoughts that occur during mind-wandering likely involve a complex interplay of activity across different brain regions, and so network-level analysis could be a promising avenue for future studies of the DMN and how people are paying attention." Moving forward, the researchers plan to study how DMN activity relates to peoples' experience and behavior using techniques other than fMRI, which Kucyi acknowledges is limited because it is based on blood flow which only indirectly reflects electrical brain activity. "We also hope to study other spontaneous behaviors that could reflect whether someone is in the zone or out of the zone, like eye movements and eye blinks, as well as more specific contents of mind-wandering such as thinking about the past versus future, or thinking about positive versus negative emotional events, rather than just the intensity of focus." Regarding other areas of research that might benefit from their study, Kucyi concludes that "ultimately, a better understanding of the function of the DMN could help us in developing ways to appropriately target this network for therapeutic purposes while avoiding side effects."